There were a gazillion plants and flowers at Joey's funeral. Well maybe not a gazillion, but it seemed like it. There were so many that we let people take home what they wanted. For years, I heard from my dear friend Meagan about her "Joey plant" and how it was doing really well. Last fall, my mother-in-law gave me a plant. It was, for all intents and purposes, pretty much dead. Hubby gave the "in the garbage" motion to me behind her back until she said, "This is a plant from Joey's funeral. I thought you would like to have it." After she left Hubby said, "That thing is dead. You're throwing it away, aren't you?" I am the grieving mother who still has her dead son's bicycle in the garage. No, I had no intention of throwing it away. "It's a Joey plant. I can't throw it away. 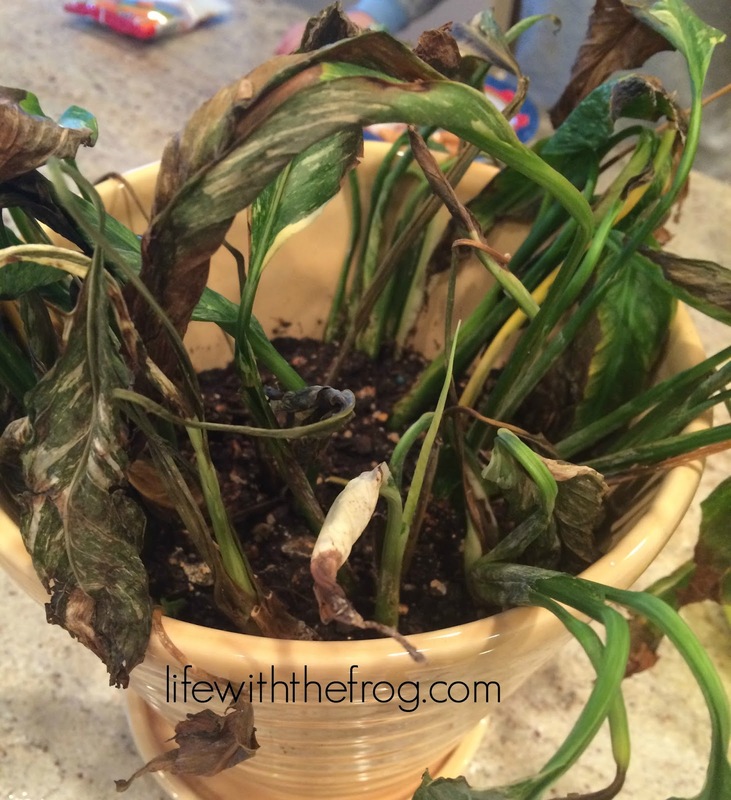 I'll see if I can bring it back to life." Hubby rolled his eyes at me and walked away. 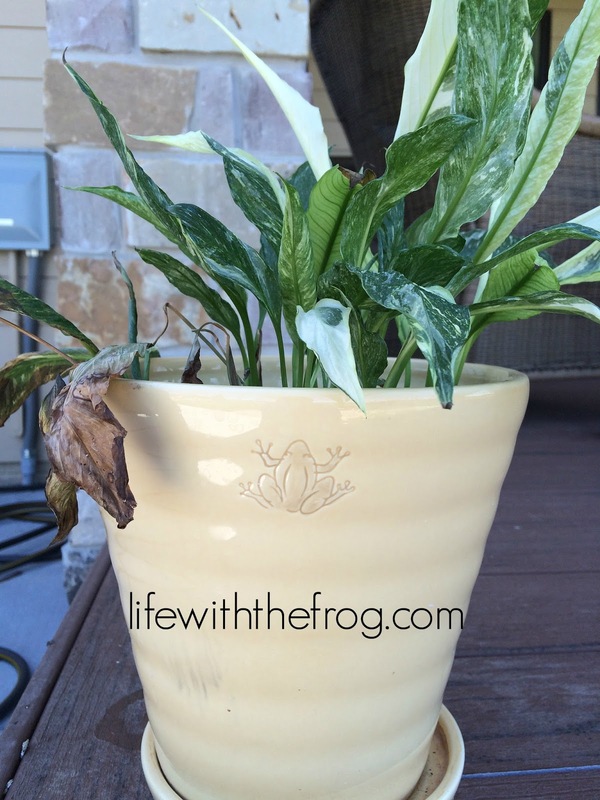 I got some new, rich soil and repotted it in a cute Pottery Barn pot with a frog on it that someone once gave to me. Every week I gave it a good soak and misted the leaves. I carefully pulled off the dead leaves so the new fresh green leaves could thrive. And slowly but surely it came back to life. Most of the dead, brown leaves have been stripped away, and new perky green leaves are taking their place. Some brown, droopy leaves remain; but you know what? I'm okay with that. The plant is like my heart. Once I ignored it. Once, I was letting it die. That summer that we lost Joey I wanted to stay in a cocoon. If everyone would have let me, I would have lain in bed that whole summer. But, despite all the brown and dead that was destroying my mama heart, there was still some green and life in there: my other boys, my husband, our families and friends. They cared. And I cared enough about all of them to plod on. Then there was a new baby who brought a burst of color to my dead, brown heart. And slowly as I tended it, it came back to life. It didn't always hurt when I talked about Joey. I could tell his stories and eventually my sad smile turned into tears of laughter. I could talk of missing him with his brothers and help them heal, too. Our hearts have greened back up again, just like the Joey plant. But the brown, dead matter still remains in part. Hubby bought me a beautiful floral bouquet for Mother's Day. As he was arranging it in a vase, he noticed one droopy, less-than-perfect flower. He picked it out and discarded it. It made me sad. Sadness, death, imperfection - no one wants them, but they are a part of life. Without them happiness, life, and joy wouldn't be as sharp, as bright or beautiful. The contrast, while ugly at times, is striking and necessary. I want to be reminded of my sadness. I want to look at pictures of Joey's kindergarten year and feel such an ache in my heart that I think I might die all over again just like I did that day I held him in my arms for the last time. When my four-year-old son tells me he wishes I could have another baby and that it would be Joey so he could meet him, I want to feel torn in two with both sadness over losing one son and joy over gaining another. I want to watch my ten-year-old helping his brother get dressed and imagine that's what Joey would be doing. I want to cradle my eight-year-old when he is tired and crying over Joey and cry with him. I want to watch my twelve-year-old with ASD sob over his twin brother's grave because that's the only time I know for sure that he cares, that his heart is not all brown and dead. I'm holding onto the brown and dead parts of my heart because they make the other parts more vibrantly green and alive. 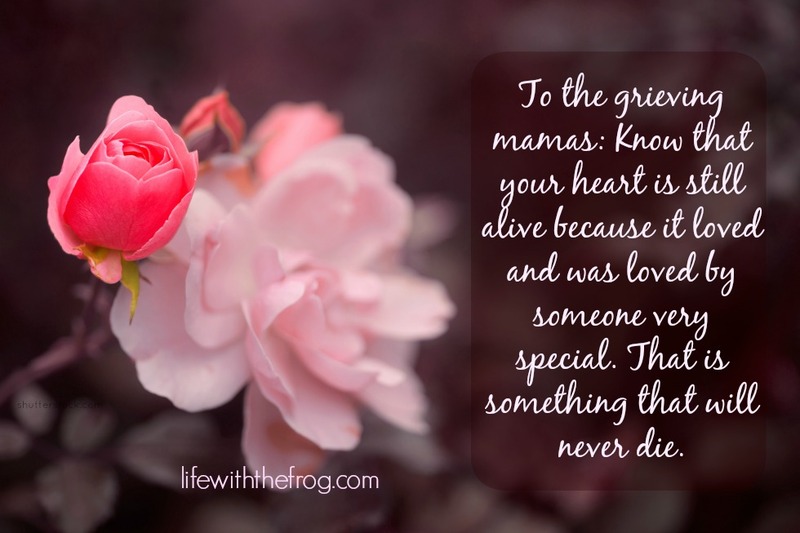 I want all grieving moms to know this: sadness can co-exist with happiness, healing can happen alongside hurt, and hope will thrive amidst despair. It's hard, so hard sometimes; but it can happen. You just need to tend to it - tend to your heart. Care for yourself, soak yourself in what makes you feel good, carefully pull away the pain and bitterness, and be okay with leaving some of the sad, dead parts as a reminder of what makes you alive. Your heart is still alive because it loved and was loved by someone very special. That is something that will never die.